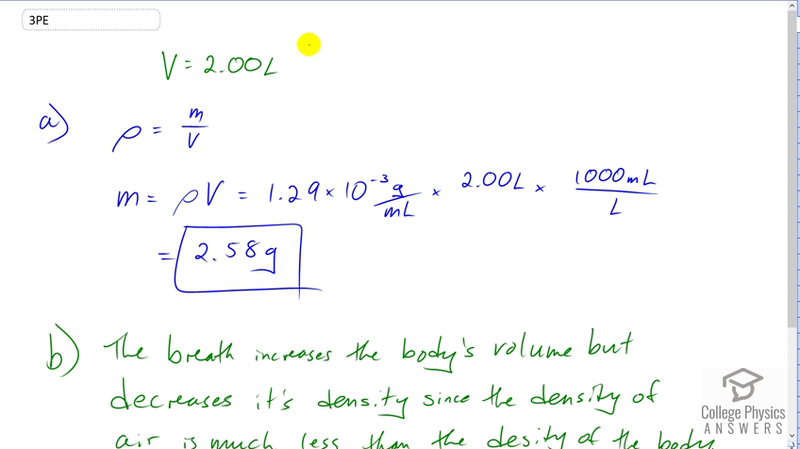 (a) What is the mass of a deep breath of air having a volume of 2.00 L? (b) Discuss the effect taking such a breath has on your body's volume and density. The breath increases the body's volume but decreases it's density since the density of air is much less than that of the body. This is College Physics Answers with Shaun Dychko. When taking a deep breath of volume two liters, we're going to figure out what mass of air has been inspired. So the density of the air is its mass divided by its volume. We can solve for m by multiplying both sides by V. So mass is density times volume and the density of air is 1.29 times ten to the minus three grams per milliliter. Multiply that by two liters converted into milliliters by multiplying by 1000 milliliters per liter and we end up with 2.58 grams. When a breath is taken in, the body's volume increases but the body's density decreases because the density of the air that has been inspired is less than the density of the body.